APPLICATION: The STP-1 is a pair of convenient attenuator pads that can be located at the precise location that attenuation is needed. The low-cost STP-1 eliminates the costly labor of figuring and assembling fixed pads. Multi-turn trimmers in the STP-1 permit precise adjustment of levels without the need to connect any jumpers or external resistors. 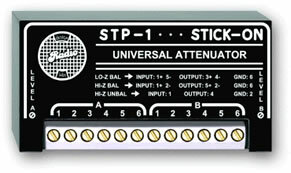 The STP-1 operates in either high or low impedance, balanced or unbalanced circuits. The wiring legend is printed on the case for easy installation.